Earlier this month on August 1st, Apple released their highly anticipated third quarter earnings. In the report, Apple boasted its third straight quarter of year-over-year accelerated growth in revenue and beat analyst predictions of earnings per share. Apple was on a roll, having sold 41 million iPhones during the quarter and driving Apple’s Services division to a record high. pMD’s users, which include physicians, nurse practitioners, physician assistants, and support staff, tend to heavily favor Apple devices. 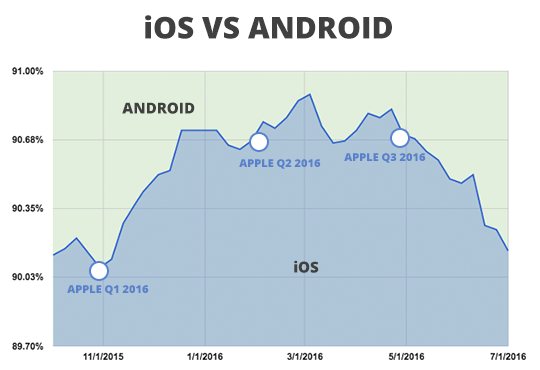 While there is usually a noticeable fluctuation among our iOS and Android device breakdown from quarter to quarter, usage among our customers’ Android and iOS devices this quarter remain unchanged from the last. 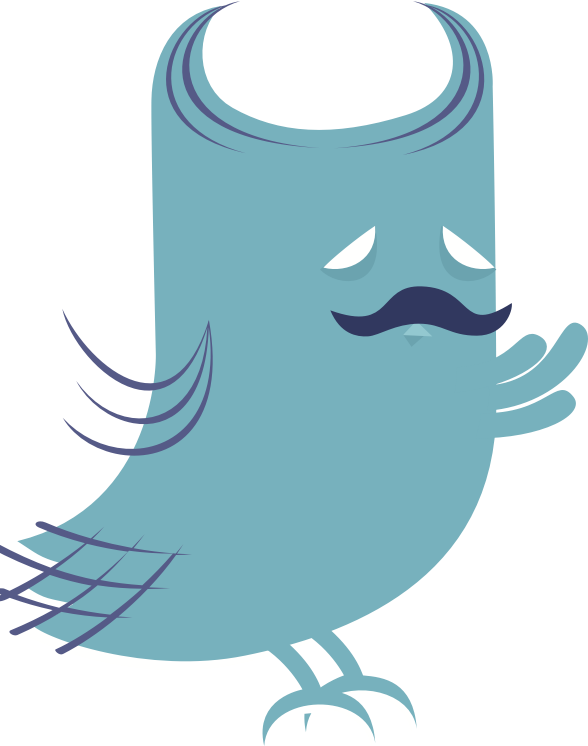 Stagnant? Perhaps. Compelling? Absolutely. With a plethora of new Android devices released last quarter, that may have been enough to entice pMD Android users from slipping away to the competition's territory. Correspondingly, Apple loyalists stood firm. Are they possibly awaiting the highly anticipated release of the iPhone 8? Looking at the breakdown of pMD’s iPhone usage by model, 7.2% of users upgraded their devices to the iPhone 7 / 7 Plus and iPhone 6S owners grew by a slim 1% margin. The iPhone 6 saw a decrease in overall users, so we can infer that users likely updated to the 6S or 7 models. Users are slowly saying goodbye to older models of the iPhone and saying hello to the new, sleeker models. It's a positive outlook for Apple next quarter. With the release of the iPhone 8 coming this fall, we can bet that Tim Cook's Q4 earnings announcement will be nothing short of enthusiastic. Today Apple will announce its fiscal year 2017 first quarter earnings and everyone is eagerly awaiting the results. Will our beloved personal technology company outperform analyst expectations or will it disappoint? We’re no analysts, but nevertheless we are here to chime in with our own predictions based on stats from the health care users of our mobile charge capture and secure messaging apps. 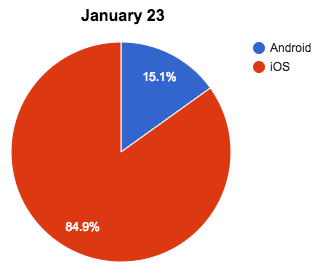 Let’s take a look at our own iOS and Android numbers to see what the mobile device breakdown looks like. Previously we had been tracking the device trends among our mobile charge capture users, including doctors, nurse practitioners, and physician assistants. Now that we have expanded our mobile functionality to include staff, primary care physicians, medical assistants, and soon to be patients, we wanted to expand our stats to reflect these folks as well. As you can see, Android increased its slice of the pie, but Apple continues to be the predominant smartphone technology in health care. Looking at the iPhone adoption by model, 12.5% of users upgraded their devices to the iPhone 7 / 7 Plus. The iPhone 6 users fell slightly, so we can surmise they either upgraded to the 7 or migrated to an Android. The speculation from industry analysts seems to be relatively less gloom & doom this time around for Apple. For one, Apple stock has been performing well. Demand for the new Apple Watch Series 2 continues to grow, especially considering that it was almost impossible to get hold of one over the holidays. The iPhone 7 and 7 Plus models seem to have done relatively well, especially considering the hefty price tag and absence of the 2-year contract subsidies from network carriers. Given our users’ adoption of the iPhone 7, we may see an upside surprise during Apple’s earnings report. Will our numbers correlate with Apple? We’ll find out at 2pm PT. All eyes were on Apple Tuesday afternoon as it announced its financial results for the fiscal 2016 fourth quarter. Despite Samsung’s best efforts to help out Apple with its Galaxy Note 7 spontaneously combusting, Apple reported its third straight quarter of year-over-year decline in revenue. Apple did, however, beat analyst estimates of earnings per share and had a bright outlook for next quarter’s revenue. As a mobile software company, mobile device trends are of particular interest to us and our user base of physicians, nurse practitioners, physician assistants, and other health care providers. 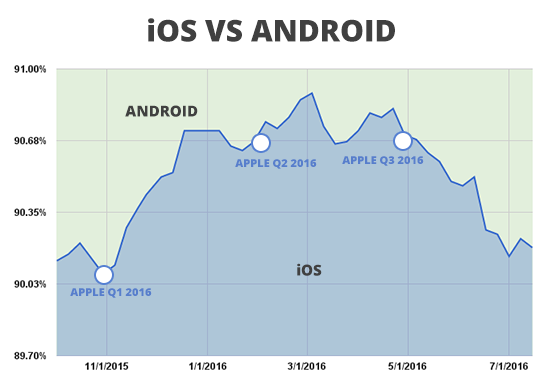 pMD’s users heavily favor Apple devices, but there is usually noticeable fluctuation among the iOS and Android device breakdown from quarter to quarter. iOS took a big hit with an unprecedented 1.1% loss to Android over the course of the quarter. This market share decline among health care providers parallels Apple’s poor fourth quarter results. Tim Cook attempted to make lemonade from lemons by saying that Apple is “thrilled with the customer response to iPhone 7, iPhone 7 Plus and Apple Watch Series 2” and calling their fiscal 2016 results “very successful.” According to our own numbers, 8.5% of users adopted the new iPhone 7 devices, which is quite impressive considering it has been just over a month since the launch date. With Apple’s positive outlook for next quarter and Samsung still licking its wounds from the Galaxy Note 7 debacle, we're looking forward to a bullish first fiscal quarter of 2017 for Apple. Apple will be announcing their third quarter earnings report this afternoon and the financial pundits are all abuzz with their speculations. The all-too-familiar doomsday reports have us wondering if it's groundhog quarter all over again. "Earnings plunge", "downgraded to sell", "iPhone decline", and a "stock slump" are just some of the chipper forecasts from analysts for today. We've been following mobile trends among the physicians, nurse practitioners, and physician assistants who use pMD's charge capture and secure messaging software to see how they stack up against the general market trends. Some of our past Apple earnings predictions have been spot on and others have missed the mark, but the data comparison quarter over quarter is compelling nonetheless. Although Apple is the indisputable favorite among health care providers, Apple lost almost half a percent of market share to Android among pMD’s users over the quarter. The decline in Apple devices may be a bad omen for Apple’s earnings this past quarter and supports the lackluster expectations swirling around the Internet. Looking at the iPhone by model breakdown, iPhone 6S owners grew by a slim margin and the 6 saw a decrease in overall users. Older models of the iPhone are slowly being phased out by newer models, but we’re not seeing the same upgrade rate than we’re accustomed to from Apple devotees. The release of the iPhone 7 in September may reverse this eye-raising trend, and considering that the iPhone accounts for two-thirds of Apple’s revenue, you can bet Apple is up for the challenge. We'll be eagerly awaiting Tim Cook's much anticipated Apple earnings announcement and Q4 plan at 2pm PT today. This week, Android took back .04 percent of the mobile device pie from Apple. With an enticing Buy One Get, One Free offer from AT&T, it's no surprise that Android is ahead this week. 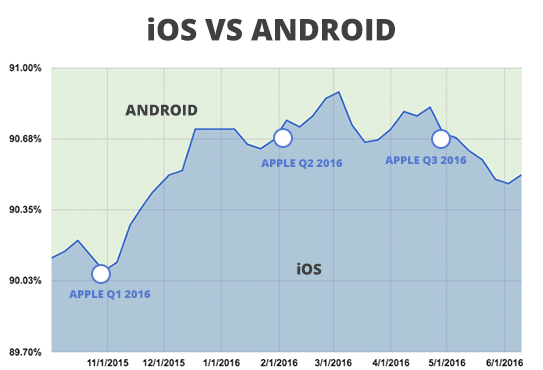 After a three week skid, Apple finally showed some positive growth in the iOS-Android wars among our health care providers! This week, Apple took back .08 percent of the mobile device pie from Android. If the rumors true, the reverse sticker shock of the upcoming iPhone 7 may be a driving factor in Apple's slow crawl back to the top. For the third week in a row, Android has topped Apple in net devices for the week, taking away an additional 0.10 percent of the mobile user base. Could the "sweet" new name reveal for Google's next generation Android operating system, the Android Nougat, be enticing enough for mobile users to make the switch? This week, Android took away 0.02 percent of the mobile device pie among our health care providers. Is Apple on a slow and steady decline or will we expect a comeback in the upcoming weeks? Android crushed Apple with a 0.24% surge in total devices this week. Could Google's hefty incentives as part of the Android Security Rewards program be the reason for the spike? After six excruciating weeks of battling it out with Android, Apple is finally back on top. This week Apple took a sweet 0.04% piece of the mobile device pie from Android. Could the impending release of the Apple watchOS3 be enticing enough to sway Android users to make the switch?